Two days after Christmas 2012 we were stuffing bikes in boxes, playing babushka with hiking bags and jamming tents, boots and all our bikepacking gear into THREE checked on items between the two of us. 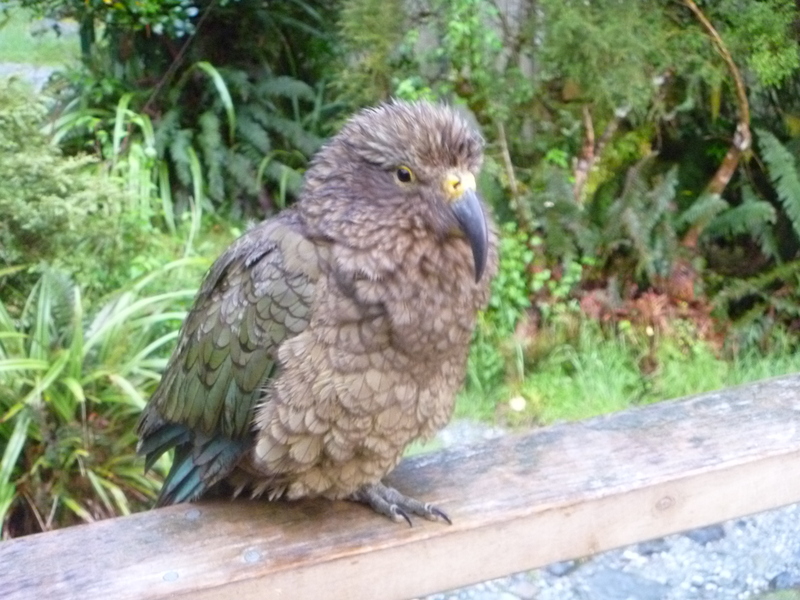 We were off for a whirlwind adventure in New Zealand! We were off to hike the famous Milford Track and then ride our bikes from Te Anau to Christchurch, off-road bikepacking style! We were hiking as a ‘not so surprise any more’ birthday present we organised for my mum and so the party consisted of mum & dad, my brother & his girlfriend plus me & The Seb. Day one was possibly the cushiest hiking I have ever done! 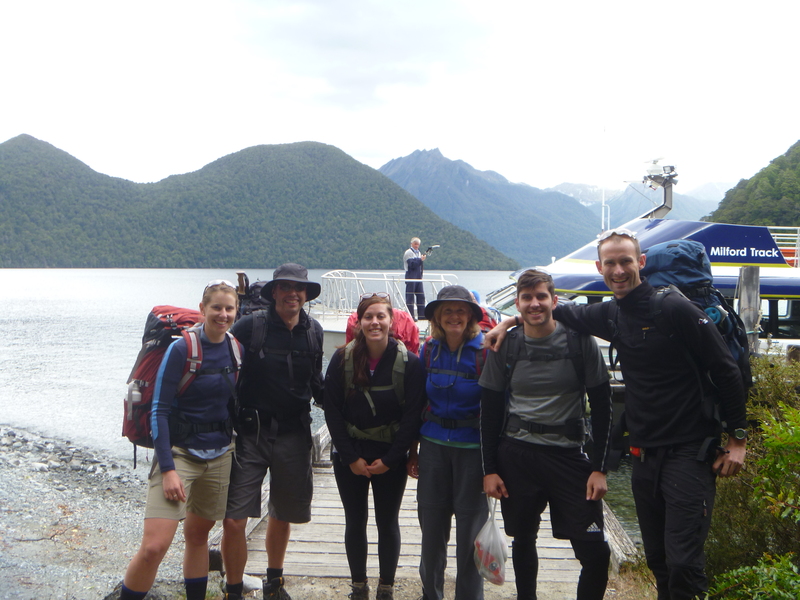 We started with a boat ride up Lake Te Anau to Glade Wharf, the start of the hike. 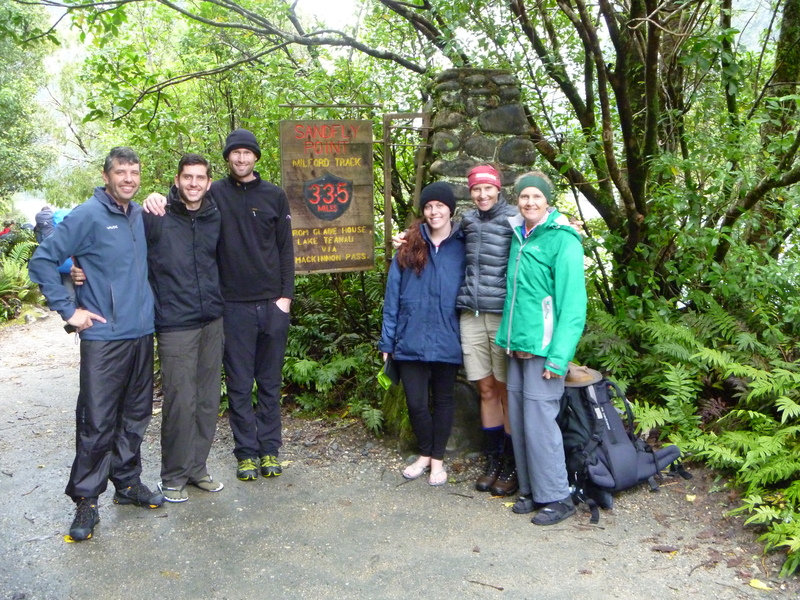 It was then a cruisey 5km stroll along the banks of the Clinton River through lush rainforest to Clinton Hut. Admittedly, this was the perfect warm up for non-seasoned walkers to get used to their packs and work out the speed we all liked to walk. Trendy hikers off the boat and ready to start walking! After 1km we walked past Glade House, the first overnight stop for guided walkers. Phew, didn’t they have a HUGE day! There was a Christmas Tree with pretty lights and very comfy looks beds with doonas overlooking the river. For the extra $2000, I’d rather be carrying my sleeping bag thanks! We got to the hut very early in the afternoon and decided that it was time for a swim. We popped down to the river to have a dip, and that was quite literally what it was. Not a swim or a paddle, a dip. The water was ice cold, straight off the snow covered peaks and the frigidness took your breath away. Standing in a swarm of sandflies on the river bank suddenly seemed more appealing! The Seb found it refreshing and said he aimed to swim at every hut we stopped at along the walk. It’s a gradual climb for a few hours from Clinton Hut as the track follows the Clinton River to its source, Lake Mintaro. The sun was shining in the beginning; lulling us into the false sense of feeling we would be walking in this glorious weather for the entire day. 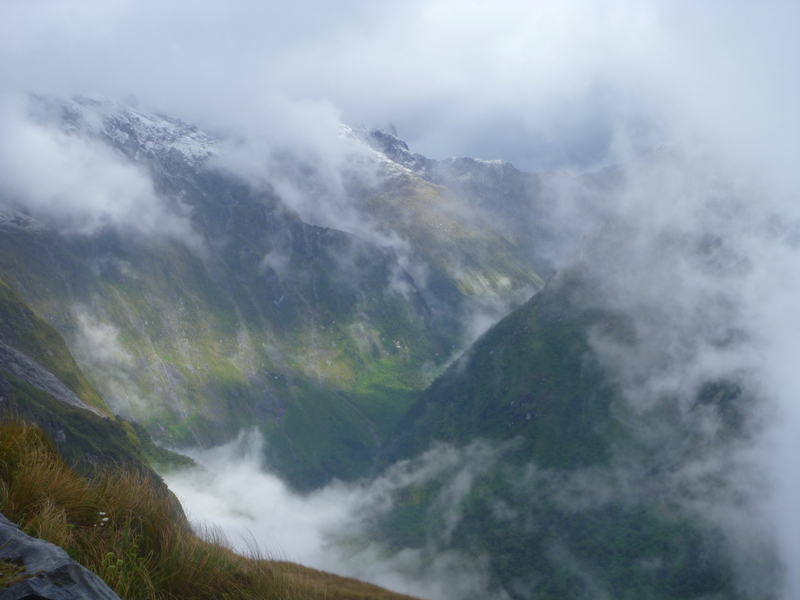 As we approached the base of Mackinnon Pass, the rain clouds were looking ominous. Not long after, the heavens opened. 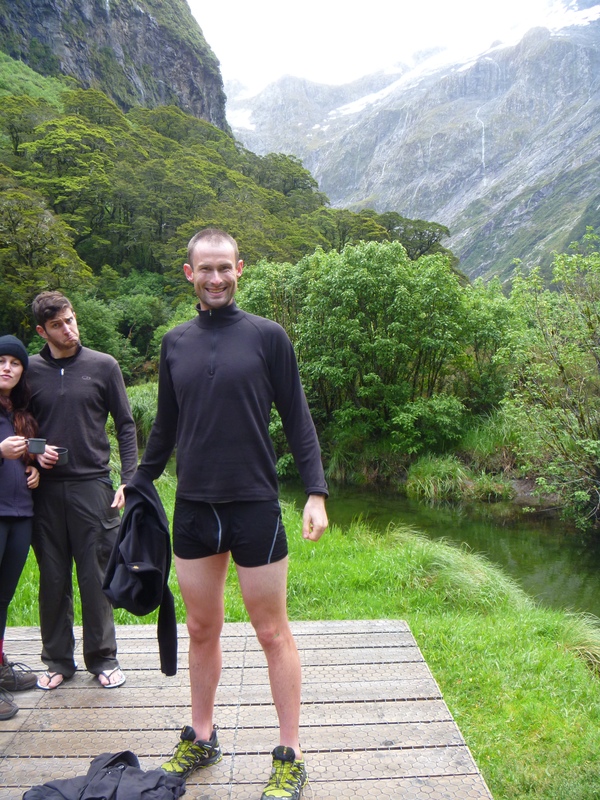 Given that the brouchers boasts “Fiordland, one of the wettest places on Earth”, we were bound to get wet in some way, shape or form. We were all prepared with the wet weather gear, so out is came as the valley walls began to turn into cascades of waterfalls. It was really raining by the time all of the 40 hikers had tricked into Mintaro Hut, filling every available space with dripping wet, sweaty, stinky clothes. We were greeted by the bubbliest hut warden who could not help but to get us excited about the rain in the valley. 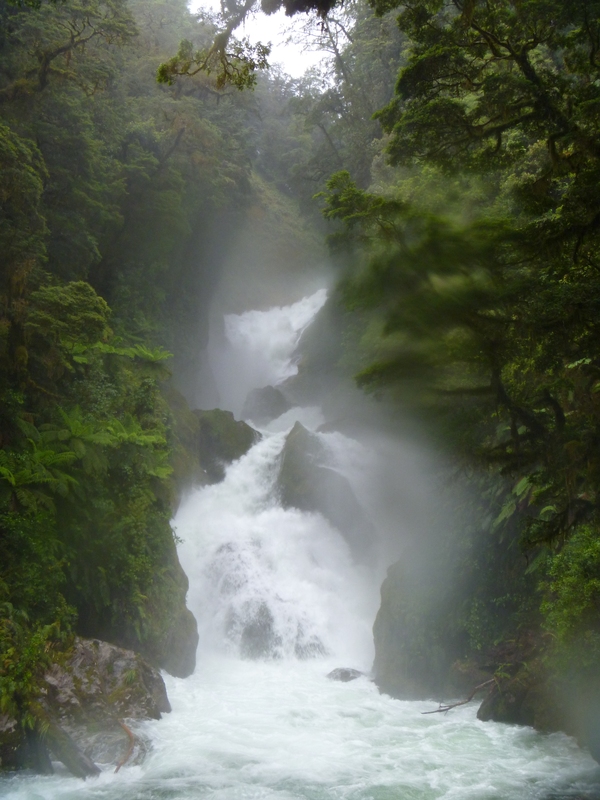 The rainforest had come alive, and with it we were being treated to the most spectacular waterfalls. Did I mentioned waterfalls?? That night we were told to take all our boots inside as a group of young and cheeky Kias had flown in and were starting to get a bit mischievous. They are known to take boots away and pry the rubber off the soles, just for fun! We walked down to the helipad where we had been advised there was a good spot for ‘swimming’. Much to the surprise of Alex and Carolyn, Seb got stark naked and launched into the deep water while screaming high-pitched profanities. Swim number two: success! Seb happy after his second ice bath. We were just glad he had some clothes on again! That morning when we stepped outside the hut we were treated to views of snow covered hills after a fresh dump had come down overnight. The snow plus the waterfalls was a very special sight. Again, did I mention waterfalls? 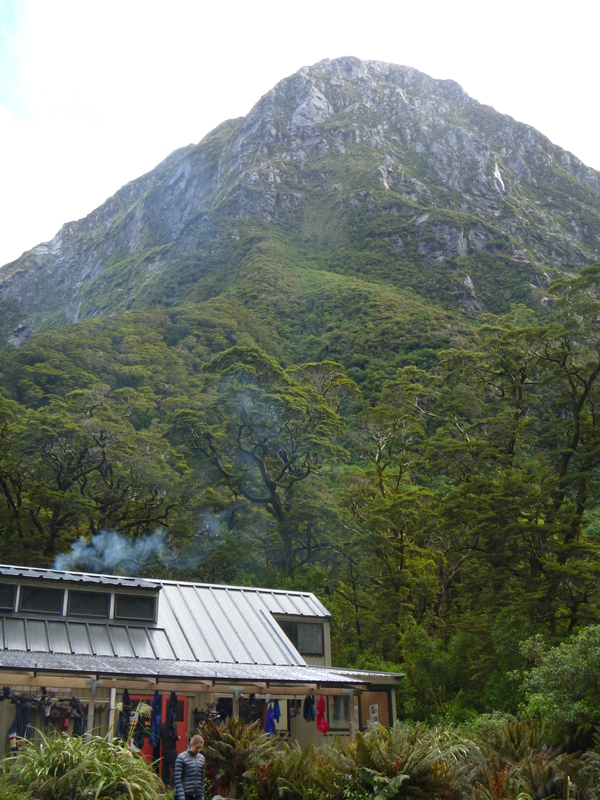 The days hike was pretty simple: climb skywards up to Mackinnon Pass then descend to Dumpling Hut on the other side. We had re-allocated a bit of mum and dad’s gear between Seb and myself to make it a bit more enjoyable for them. Unfortunately the weather came in quickly as we ascended and by the top it was windy, raining and freezing. We could only catch glimpses of the astounding views through fast moving clouds. Down the other side of the pass we crossed huge avalanche chutes and wild waterways before descending back into the treeline. The rest of the day we walked down, down, down. The 8km descent from Mackinnon Pass drops 970m over rocky, uneven ground. 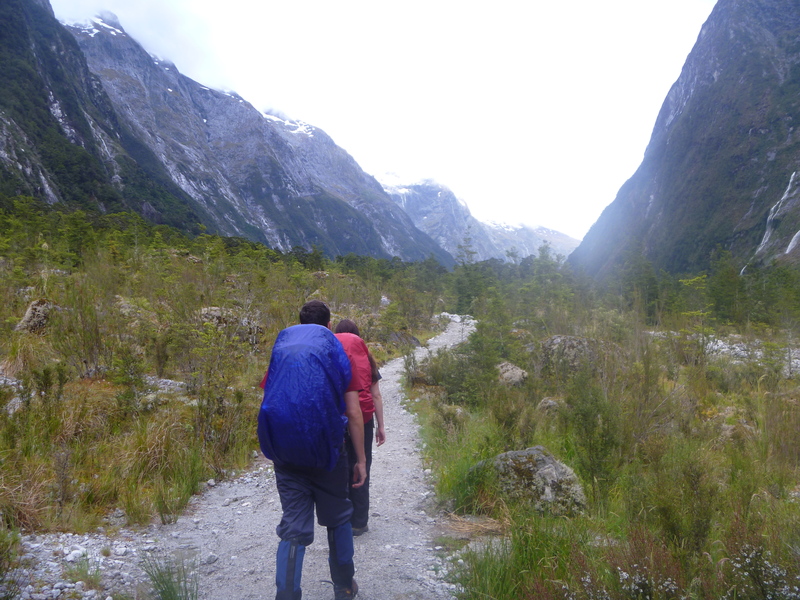 Knees screaming, the terrain finally flattened out and we walked parallel to the river to Dumpling Hut. Seb made time for his obligatory swim, though it was raining and cold and when he arrived back to the hut he didn’t seem as happy as after the first few swims. Before our New Years Eve celebrations began, the hut warden gave us the warning that extremely heavy was forecast for that night and we weren’t to leave the hut in the morning without his OK. After getting stuck into our wine and port, we still only made it to 9pm and crawled off to bed amidst the heaviest rain I have ever experienced. Happy New Year! Indeed the rain was set in and we weren’t to go anywhere. The track was flooded in both directions, well over our heads in some places. We were instructed to stay put and a decision would be made the following day. Helicopters few up and down the valley, taking guided walkers onto the next hut (apparently this is cheaper for DOC instead of losing $80,000 by cancelling the walk for the next group about to start the hike). We weren’t so lucky as to get a helicopter and spent the entire day inside playing cards, eating the last scraps of food we had and playing more cards. It could have been worse, but there is definitely a limit as to the number of hours you can play card with the same six people. I had quite a bad flu going on and was grateful for the rest, sleeping for at least half of the day! The ranger saved us by handing over two cans on tomatoes which we added to our half packet of spaghetti for dinner and porridge for dessert kept our tummys happy. Dumping Hut amidst the waterfalls. For a place with an average rainfall of more than 8m (no that is not a typo, I did indeed mean eight meters), it was pretty wicked to be there in a full downpour. We received 460mm of rain in the 24 hours we were at Dumpling Hut, which is more than Canberra’s average ANNUAL rainfall. It was just incredible. The mountains themselves had turned into giant waterfalls. Water pumping down MacKay Falls. We were given the OK to walk the complete day four, however the ranger came with us for the first hour to see us through a notoriously bad section in floods. We crossed enormous swing bridges, waded through rivers up to our knees and were grinning ear to ear about being wet down to the bone. Once you embrace the wetness, it is so much fun to stomp through puddles, creeks and rivers! Finally we made it to Sandfly Point, the end of the Milford Tack. We had an hour to endure the swarms of stinging little sandflies before catching a boat out onto to Milford Sound and across to the awaiting bus. Luckily, even though we were a day late, we were all able to hop on a bus back to Te Anau. I loved hiking with the family and I loved seeing that pure satisfaction from my parents, brother and Carolyn after finishing their first ever hike. 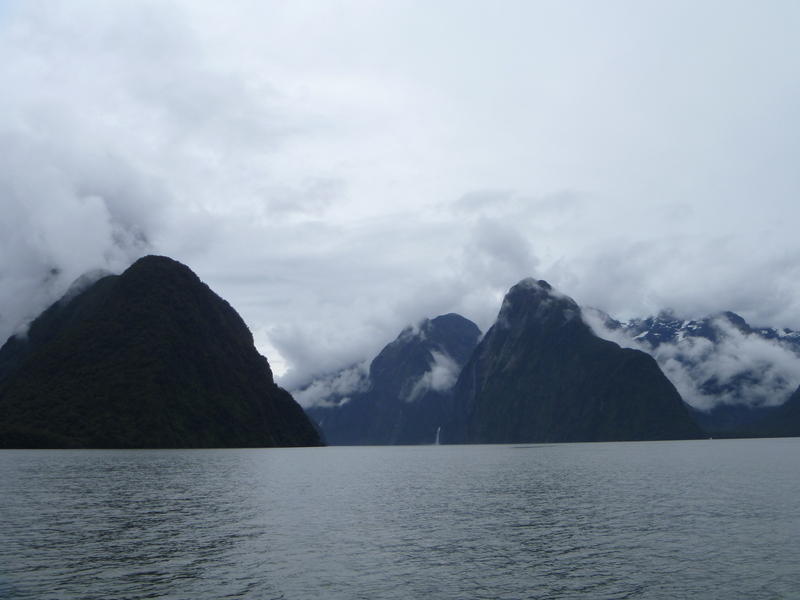 I would recommend it to anyone who enjoys mountains, rain, birds, big views, waterfalls, fjords and rainforests. 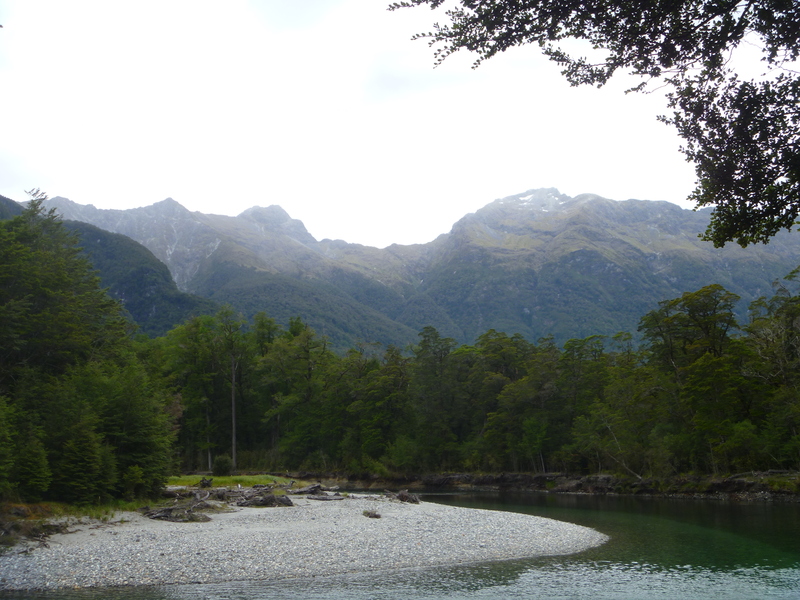 In fact, I don’t imagine there would be anyone who wouldn’t enjoy this place; Fiordland is truly magnificent. When we got back to Te Anau we discovered we had even made it in the local newspaper, everyone was talking about the trapped and soggy New Year’s Eve walkers! 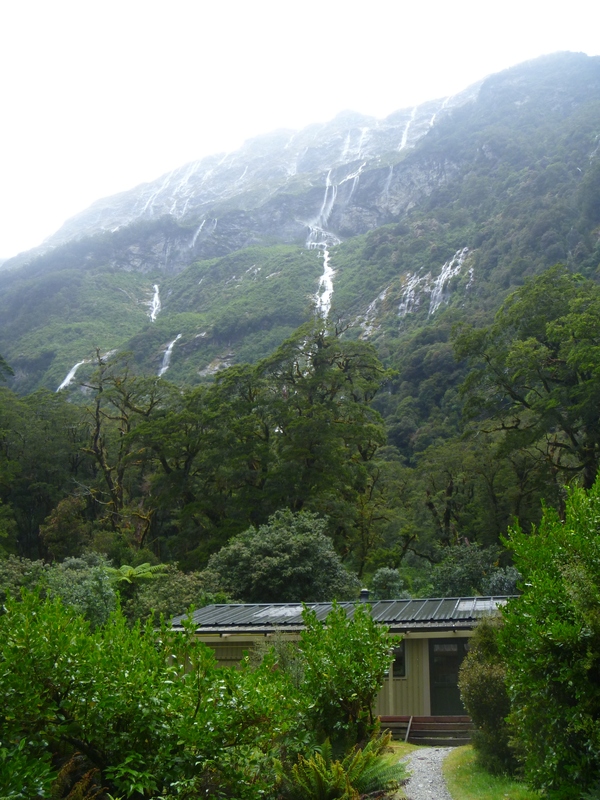 This entry was posted in BikingBethany and tagged hiking, mountains, new zealand, tramping, waterfalls on January 29, 2013 by bethany.